Keep an eye on the consistency of the dough after you add the third egg. If it seems wet, add just the egg yolk and not the egg whites. If after adding all 4 eggs the dough seems dry, add 1 Tbsp of water or more as needed. The pastry dough should be moist and pliable but not dry. 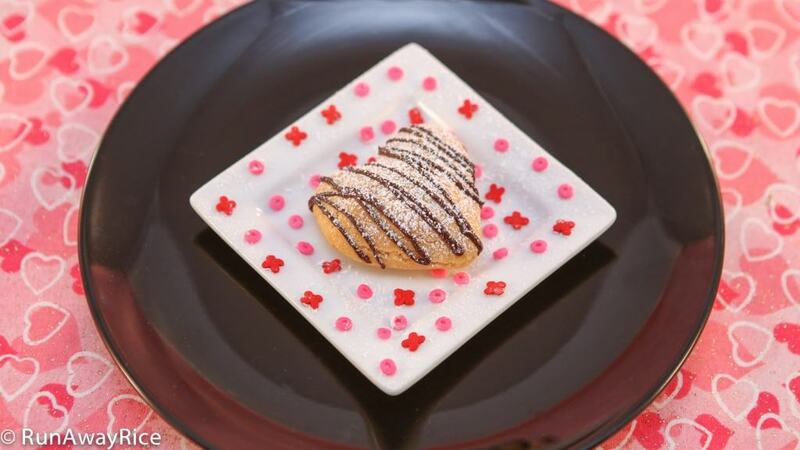 Test by placing a dollop of the dough on a plate. It should hold its shape and not ooze. If it’s too wet, sift in a little flour. After placing the puffs on a baking sheet, bake them right away. Don’t let them sit long or the dough will get too soft. The time-consuming part of the recipe is making the puffs. If you’re pressed for time, simply drop spoonfuls of the dough onto a baking sheet like you would drop biscuits or cookie dough. For fancier, prettier puffs, use a pastry bag fitted with a decorative tip. Another option is to bake the puffs in muffin pans. The mini-muffin pans work really well if you don’t want to fuss with a pastry bag but want the puffs to be a bit more uniform. 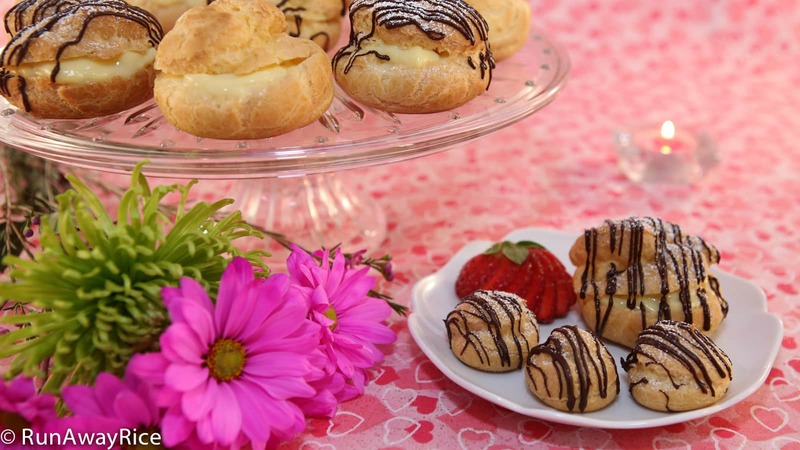 If you’d like to make the Cream Puffs in advance, make the filling and puffs the day before and refrigerate. Allow the puffs and filling to come to room temperature before assembling and serving. Refrigerate any uneaten portions. These puffs are best if eaten within 1-2 days. A shortcut for making the filling from scratch is to use instant pudding. For even more time-savings, buy the ready-to-eat pudding cups–it doesn’t get simpler than that! The instant pudding or pudding cups are super convenient and inexpensive and nowadays there are many more flavor options other than chocolate and vanilla. For a lighter fluffier filling, add equal parts of whipped cream or non-dairy whipped topping to the custard or pudding. Coconut – replace half of the milk with coconut milk. Optionally, add grated coconut flakes for more flavor and texture. If you enjoyed this recipe, you may also like: Pandan Waffle Cones and Cookies, Red Velvet Cupcakes with Cream Cheese Frosting, and Orange Chiffon Cake with Edible Flowers. In a medium saucepan, bring the milk to a gentle boil over Medium heat and then turn-off the heat. Measure out 1 cup of hot milk and set aside. Leave the remaining milk in the saucepan. In a separate saucepan, add sugar, flour, cornstarch, egg yolks and the cup of milk set aside earlier. Whisk together combining all ingredients well. Using a sieve, strain the custard mixture into the remaining milk still in the saucepan. Over Medium Low heat, stir constantly while cooking the sauce until it thickens, approximately 3-4 minutes. Turn-off the heat. Whip the custard vigorously for 1 minute to remove any lumps. Add the vanilla extract and combine well. Transfer to a bowl and cover the custard surface with plastic wrap to prevent a skin from forming. Combine flour, baking powder, cornstarch, salt, and vanilla sugar and sift. In a saucepan over Medium heat, add water and butter and cook until the butter is melted. When the liquid just starts to boil, reduce the heat to Low. Add the sifted flour mixture and quickly stir together making a soft dough. Cook for about 2 minutes. Transfer the dough to a mixing bowl. Spread out the dough and allow to cool for 5 minutes. Add 1 egg to the dough and mix on Low speed for 1 minute. Continue adding the eggs one at a time and then mixing for 1 minute until all the eggs are added. Place tablespoonfuls of dough onto a large baking sheet or use a pastry bag to make the puffs. Wet fingertips with water and then gently press the top of each puff flattening any peaks. Bake for 25-30 minutes until puffy and golden brown. Remove puffs from the oven. Pierce each puff with a toothpick to release any hot air inside, place on a cooling rack and allow to cool for 20 minutes. Use a hand blender to whip the custard filling so it’s smooth and creamy. Cut each puff in half lengthwise but not all the way across. Pull back the top. Fill the puff with a generous amount of the custard filling. 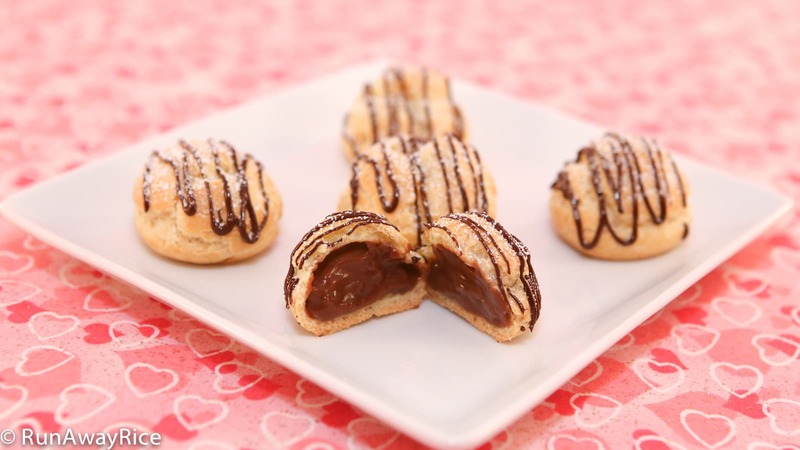 Optionally, drizzle the puffs with melted chocolate and dust with powdered sugar. 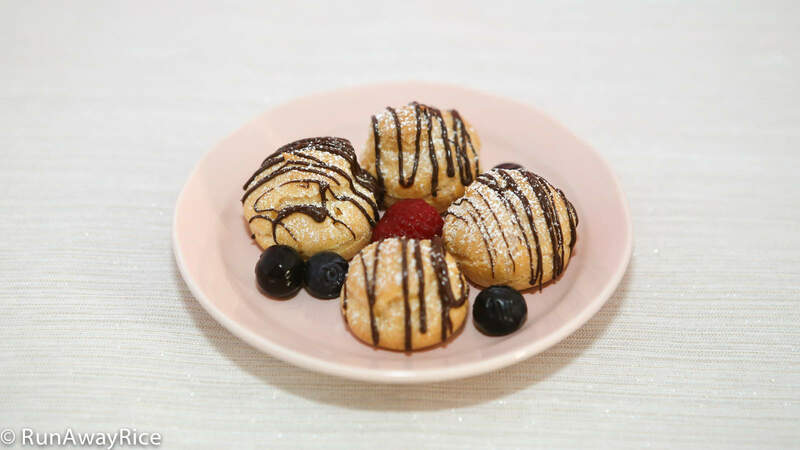 I am going to make the cream puffs, however, I have a difficultly to buy the vanilla sugar. Is that any substitution? Yes, the vanilla sugar can be difficult to find unless you go to a Vietnamese grocery store. You can substitute with 1/2 tsp vanilla extract. Good Luck!